Many Native Americans hold South Dakota's official bread in high regard - too high, says journalist Suzan Shown Harjo, whose January column in Indian Country Today suggesting people give up fry bread for their health prompted some outrage. The spell of fry bread is strong - a quick poll of 45 Native Americans across the country reinforces that. Only one respondent said he would give up fry bread forever because of fat. Others said they would cut back but wouldn't stop nibbling completely. Virgil Taken Alive, a morning disc jockey at KLND radio in Little Eagle, has had six heart bypass surgeries. He has cut back on fry bread, but he hasn't given it up. "Whenever they serve it, I love to eat it," Taken Alive said. Considering the loyalty the tempting golden brown disks inspire, it's safe to say fry bread is here to stay. So is there a way to make it more heart-friendly, especially for a culture that faces high obesity rates and related health risks? Native American culture and food expert Valerian Three Irons tinkered with his traditional recipe to find out. Three Irons, a diversity and service learning associate at South Dakota State University in Brookings, teaches about Native American culture to students from schools around the country to prepare them to be immersed in reservation life, where they will work and reside for 10 weeks. "Food is a big part of Indian culture, so it's important they learn about it," Three Irons said. This fall, Three Irons has three students: Erin Wright from Goucher College in Baltimore, Michaela Raikes from Stanford University in Palo Alto, Calif., and Miranda Blue from Carleton College in Northfield, Minn. Only Wright had tried fry bread before coming to South Dakota. The first session of "Fry bread 101" began in the Volga home of Three Irons, where he and his wife, Mary, taught all there is to know about fry bread. They prepared two versions, original and whole wheat. As Three Irons turned the mushy dough into the Native American delicacy, he told his great-grandmother's fry bread creation story. Fry bread goes back to the time when steamboats came up the river, Three Irons said. Traders from the boats often would do business with the Native Americans. One trader wanted Native women to slaughter and render a pig for him. As the women prepared a meal for the man, they decided to save time by using the oil from the pig to cook corn dough, and fry bread was invented. When the original and whole-wheat fry bread finished cooking, Three Irons analyzed the whole-wheat bread. As he held it in his hand, he noticed a difference in weight and said, "There's calories missing." He then sliced samples for the students. Three Irons noticed a little difference in taste but particularly in texture. Of the students, Wright preferred the taste of the original, Raikes said she could not tell the difference and Blue said, "They're both yummy." "I kind of expected there to be a difference because there is a difference in the main ingredient," Three Irons said. "I thought the texture would be the same, but I found it to be a little more coarse. But the taste is similar and a little bit drier." If they had to choose one over the other, all three students said they would choose the whole wheat because it's healthier. Dietitian Teresa Beach with Sioux Valley Hospital has analyzed the health benefits of the two recipes. Three Irons' original fry bread recipe contains 282 calories in a 3-ounce piece about 5 inches in diameter, and the whole-wheat version contains 250 calories. The whole-wheat version has 7 grams of fiber; the original, 2 grams. There were 46 grams of carbohydrates in the whole-wheat fry bread and 52 grams in the original. The significant difference was in the type of oil used in the whole-wheat version. Three Irons chose canola oil for the whole wheat over soybean oil to give it a healthier monounsaturated fat, Beach said. "The total fat in the healthier version was 4.5 grams, and for the not-so-healthy 4.1 grams," Beach said. "It's just that it's a better type of fat." After the fry bread preparation, the Three Irons and the students were joined for an Indian taco dinner by SDSU Director of Diversity Allen Branum and his wife, Jan.
Three Irons said a blessing and instructed the students on how to build an Indian taco. All three chose the original fry bread over the whole wheat, but Branum decided to try the healthier version. He generally has a preference for whole-wheat breads, but after a few bites, he decided he liked the original version better. "The regular is what I'm used to. It has a flavor that is more addictive," Branum said. "I'm very pleased there is a whole wheat out there, and I will dine on both in the future." Once people realize there isn't much of a difference in taste, they might start using whole-wheat flour, Three Irons said, but they have to try it first. Does he think people would ever quit eating fry bread? For both: Blend 4 cups of flour with the rest of the dry ingredients in a large bowl. Add the wet ingredients, and mix with a spoon. Slowly add 4 more cups of flour. Gently knead the dough to form a ball. Be cautious to not overwork the dough because it will become tough. Heat 3 to 4 inches of oil in an electric skillet, large cast iron frying pan or deep fat fryer to 368 degrees (the higher temperature is important to prevent too much oil from soaking into the bread). Test the oil by dropping a small half-dollar-size piece of dough into the oil. When the oil is ready, the dough will bubble up and float to the top. From the large ball of dough, pull off a small piece and flatten, using your hands or a rolling pin, to about a half-inch thickness and about 4 to 5 inches in diameter. Punch a small hole in the center, and put into the hot oil. Cook until golden brown on one side, and turn over until browned on both sides. Drain on paper towels. Mash the berries or fruit (with peaches, it is good to cook them a little first). Save some of the water to mix up the cornstarch. Put mashed fruit, sugar and water into a pan, and bring slowly to a boil. Remove from heat, and stir in cornstarch mixture (be sure the cornstarch mixture isn't lumpy). Place back on low heat, and stir well until thickened to the consistency of pudding. Can be served as a dip for fry bread. 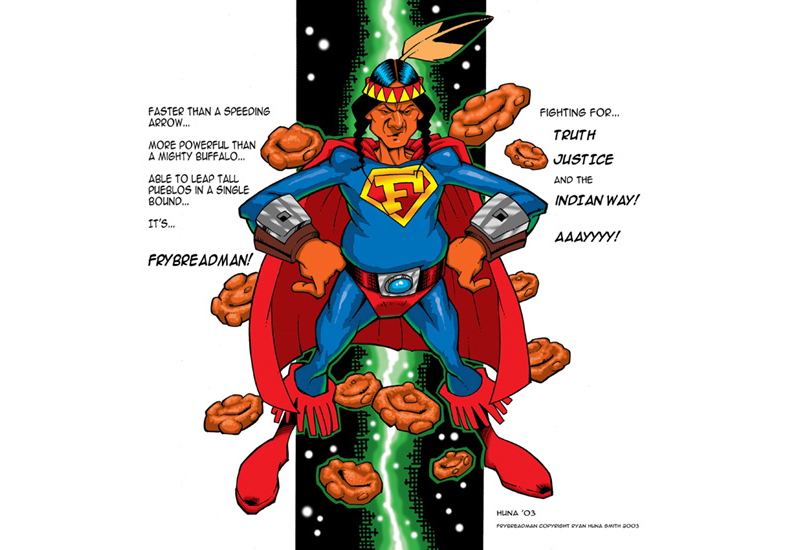 Commodity foods haven't offered best health benefits Native American culture and food expert Valerian Three Irons says fry bread is not the only culprit in the high rate of obesity, heart disease and diabetes among Native Americans. In the 1950s, the U.S. Department of Agriculture began distributing foods to people with certain income guidelines, Three Irons said. On the reservation, those foods came to be known as "commods," short for commodity foods. Among the foods distributed included white rice, fruit packed in heavy syrup, white flour, canned meats with an inch of hardened lard on top and peanut butter topped with grease. These resulted in fat, unhealthy people with "commod-bods," Three Irons said. "An excess amount of any one thing is a killer," Three Irons said. He thinks a better way to address health epidemics is through education and a few adjustments to the commodity program. "Commodity programs can change. They've proven that with the use of juices and the introduction of buffalo over hamburger," Three Irons said. "So this is another one they can do by changing bleached flour with whole-wheat flour."